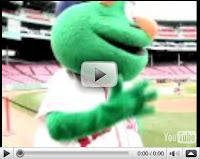 Last month, I filmed a promo video in Fenway Park, home of the Boston Red Sox. The PR company I work with, Creative Concepts, organized a meet-up between Bigelow Tea's president, Cindi Bigelow, and Wally the Green Monster (aka the Red Sox mascot). The fruits of our labor -- which, off-camera, included evading all the public tours who were trying to swarm Wally -- can be seen at the Bigelow Tea blog. That was the strangest episode of STBD I have ever seen, but now I know not to wring out the tea bag!